They will skate again will be at The Venice Skate Saturday July 25th 10-3pm. This will change your life and bring the biggest smile to your face for days after! Approximately 250,000 people in this country currently live with permanent spinal cord injuries. Treatment for SCI survivors is targeted at providing clients with the skills to live as fully as possible. Physical and occupational therapists as well as massage therapists are helping these patients gain the skills they need to function. Ultimately about 90% of all SCI patients are able to live independently with these new skills. Life Rolls On empowers the spirit, the body and the mind. They will Skate Again sessions in our town of Venice this summer which also the local home town area of founder Jesse Billauer this Saturday July 25th 9-4pm 2015. Check their website for all events. About Spinal Cord Injuries and Massage. Creative Chakra Spa bodyworkers specialize in energy and light-touch work with their SCI clients including therapeutic touch, reiki, craniosacral therapy, and any number of other modalities, can be especially powerful. As SCI clients’ muscle tone changes, our clients are likely to experience postural distortions that can be quite painful. Massage can help to limit this process and reduce the pain associated with it. Massage can be a powerful tool in keeping these changes at bay and SCI clients have to cope with chronic tendinitis and overuse syndromes in their hands, wrists, elbows and shoulders. In these cases it’s not only appropriate, but essential to receive bodywork that can help to restore function as quickly as possible. In addition, addressing the mechanical challenges of being confined to a wheelchair. The spasticity that SCI patients live with is a chronically progressive situation. This progress can be slowed or even halted with a carefully applied program of exercise and stretching-massage. Spinal cord injury (SCI) is a situation in which some or all of the fibers in the spinal cord are damaged. If the spinal cord is intact, some motor or sensory function may remain in the affected tissues. This factor will determine what kind of recovery a person can expect to achieve. Obviously, the higher the damage, the more of the body is affected. Injuries to the anterior part of the cord affect motor function, while damage to the posterior aspect affects the senses of touch, proprioception, and vibration. Damage to the lateral parts of the cord interrupts sensations of pain and temperature. An injury that affects the lower abdomen and extremities, but leaves the chest and arms intact, is called paraplegia. An injury that impacts the body from the neck down is called tetraplegia or quadriplegia. Among the SCI patients alive today, quadriplegics slightly outnumber paraplegics. • Deep vein thrombosis, pulmonary embolism. New treatment options for SCI patients are being developed daily. Some SCI patients may have electrodes implanted in muscles that are controlled from an external computer. These implants can provide pinching and gripping capabilities for people who otherwise would not have the use of their hands. Surgical transfer of healthy tendons can also be helpful. For some people, the triceps muscle may be paralyzed, while the deltoid is not. Surgically extending the posterior deltoid tendon and attaching it to the olecranon can provide these people with the power it takes to use a wheelchair. Support LRO in the work they do to empower and research all the possibilities to enrich the lives of those who have a spinal cord injury. These people can range from a family member at 60yrs old, a mountain biking athlete or a 17 yr old professional surfer, such as founder of LRO, Jesse Billauer. All pro-surfers know the risk, but it rarely happens and as Jesse proves, surfing is freedom of the spirit and he still surfs the biggest waves all over the world, wheelchair or not! An inspiration to us all. 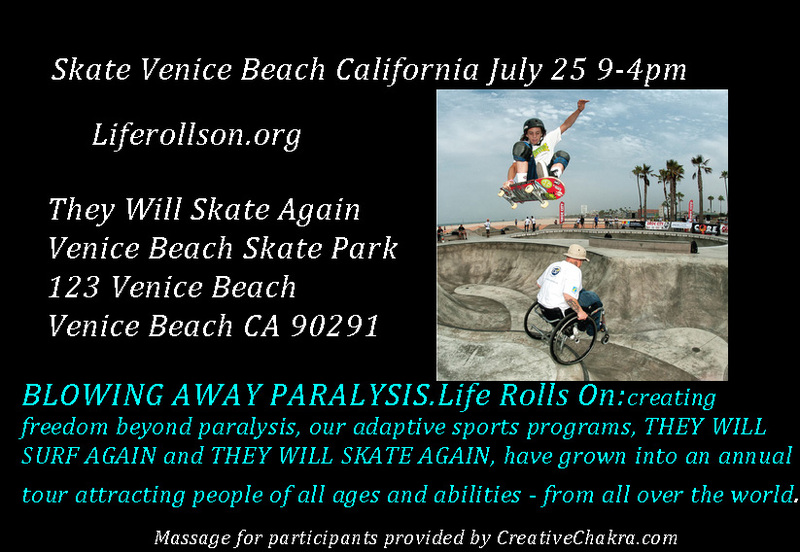 This entry was posted in Ayurveda, couples massage, Green, Massage, Uncategorized and tagged Creative chakra spa, massage, they will skate again, venice beach, venice chamber, venice skate park.